Ciabatta bread, or “Italian slipper bread”, is nice and crisp on the outside and soft and chewy on the inside. It is one of the many types of artisan breads that can be made for this sandwich. 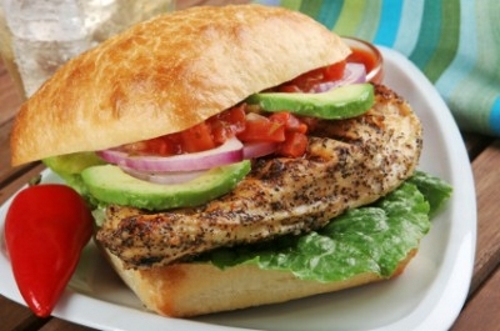 This Italian Seasoned Chicken sandwich can be spiced up any way you like. I normally just combine a little oregano, basil, thyme and marjoram. Also make sure the bread is nice and warm when served. Enjoy! Using a KitchenAid, pour the water, wheat gluten, salt, sugar, and yeast in the bowl. Let stand for 10 to 13 minutes. Attach the dough hook to the mixer and add the flour to the mixture a little at a time and blend on slow speed. Turn the speed up one notch and continue to blend the mixture while scraping the sides with a spatula. The mixture will form a sticky dough that resembles a thick cake batter. Cover the bowl with a dish towel and set aside in a warm spot for around 8 to 10 hours until tripled in size. Dust a baking sheet with the cornmeal and pre-heat the oven to 400 degrees. Toss the dough out on a floured board and kneed for 2 minutes. Flour your hands and shape the dough into squares. Place the dough on the cookie sheet and dust with more cornmeal. Bake for 25 to 30 minutes until the buns are golden brown on top. Remove and let stand on a wire rack for 5 to 10 minutes before slicing. In a small bowl, mix together the pepper, salt, oregano, basil, thyme, marjoram and garlic powder. In a large frying pan, sauté the chicken breasts in the olive oil for 3 to 4 minutes on each side. Assemble by placing the mayonnaise on the ciabatta bread, add the lettuce, chicken, avocado, red onion and chopped tomatoes.